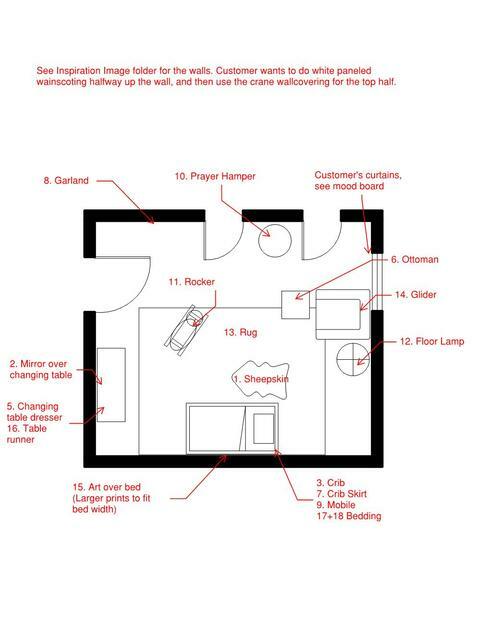 The room is "Room 3" in the attached floor plan. This is the color of the carpet: https://shawfloors.com/flooring/carpet/details/titanium-tonal-ea711/glacier-caves. I'd like to see them use my existing RH curtains (https://www.restorationhardware.com/catalog/product/product.jsp?productId=prod1159290&categoryId=cat1560032 in Fog color) but I'm open to different ones as long as they are blackout. My style is Restoration Hardware (the less modern stuff) and Pottery Barn. I'm hoping to keep this ~$5K. Thanks for putting this design together and being so quick! Love the Eliza Gilt Frames and all the little details. Thanks again! For your main color, we chose to use blue because it is calming, relaxing, and serene. It ris reminiscent of blue skies and deep blue oceans. This color works well in bedrooms and can help turn your space into a soothing sanctuary. The inspiration for the Harbor Haze is from the "Haint Blue" paint historically used throughout the south. I recommend matching your paint samples to your wall covering, and staying within the aqua/blue/grey families. Macramé Crib Skirt Crib Skirt Discount link available to project holder only • Trim: 4"L. • Drop length: 17". Melvin Ivory Area Rug Area Rug Discount link available to project holder only 7'6" x 9'6"
Eliza Gilt Single Opening Frames Picture Frame Discount link available to project holder only 24" x 24"
Eliza Gilt Single Opening Frame Picture Frame Discount link available to project holder only 11" x 14"
Quantity: 2 Picture Frame Discount link available to project holder only 8" x 10"
Eliza Gilt Single Opening Frame Picture Frame Discount link available to project holder only 8" x 10"
Quantity: 2 Picture Frame Discount link available to project holder only 5" x 7"
Eliza Gilt Single Opening Frame Picture Frame Discount link available to project holder only 5" x 7"